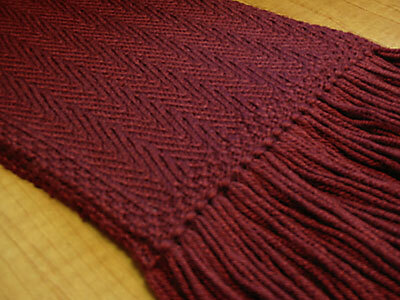 I really, really, really like the finished scarf. The pattern has the slightest bit of texture to it, and it produces an pseudo-illusion effect when you look at it from different angles. At some angles the pattern shows up as a zigzag; at some angles you see vertical stripes. The effect is subtle, elegant, and looks good dressed-up or dressed-down. My one complaint is the amount of curl in the finished scarf; the moss-stitch border didn’t do as much as I hoped it would to stop that from happening—seed stitch might have been a better choice. The current line of Rowan Cashsoft DK is 40% microfibre (it used to be 30%), which lends a nice sheen and more durability to the finished fabric—it is both machine-washable and ironable—but makes it that much harder to block the curl out of it. Regular ol’ wet-blocking with pins and towels wasn’t enough, so I did something that would make many knitters gasp and took an iron to it on medium-high heat (oh, me and my abuse of good yarn). It took a bit of the loft out of the yarn, but otherwise nothing bad happened, and it did a better job of beating it into submission, although there is still a tendency to curl that increases with wear. 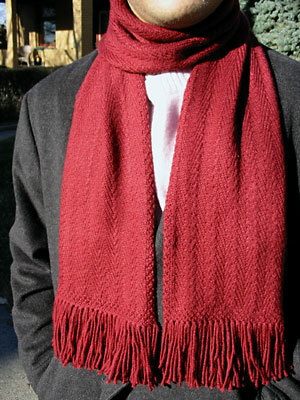 CogKnition posted this on January 2nd, 2007 @ 3:35pm in Finished Objects, Scarves & Wraps | Permalink to "Red Herring Scarf"
Ohhh that is stunning! Thank you for the pattern!! Nice! I just downloaded and printed out your Archernar scarf. Love them both! Thank you so much! That is beatiful–looks almost woven! Thank you for the lovely pattern. I think I will try it in alpaca. So subtle! Gorgeous! Right ON! Glad you like the pattern, everyone! A fellow knitter found an error in it; please download a corrected version here.